Get your Live Today Better Bonus Kit today! Learn to live today better than yesterday. Have you ever looked back on your life and realized you had a turning point? You unknowingly had been travelling in the wrong direction, but then something kind of shook you awake and you realized you needed to do an immediate U-turn? Well, I can honestly recall several of these turning points in my life and fortunately somehow – someway I was always able to make changes and get back on track. One time that stands out in my mind was when I was still working as an attorney. I had invested so much of my time, energy and attention to my career that it overshadowed everything else. But, one day it all changed. After getting home from a long day of work, I decided I would relax for awhile. I plopped down on my couch and watched some television. I ended up watching a show about the importance of having balance in your life. People who make living a balanced life a priority are happier, mentally healthier, more optimistic, more likely to find meaning and purpose in their lives, and more likely to accomplish their desired outcomes. And, while I was watching that television show, it dawned on me at that exact moment – I wanted all those benefits in my life, but I was sooooo out of balance. It was time to make a U-Turn. The light finally clicked on that night. Then I had another “aha” moment and that’s when I discovered the Power Circle. I realized that night I was going to have to start doing things differently. I also knew I was going to have to be very strategic and have a solid plan because work and the “stuff of life” just had a way of sucking me in completely. I decided I would break my life down into the most important areas and come up with a way to make certain I was putting some of my attention on each area. I knew I needed my highest and best self – my Extraordinary Side – to flow into each area. And, that was the spark that triggered the thinking that would eventually lead me to the discovery of the Power Circle. So, what is your Power Circle? It’s your engine. It’s your Extraordinary Side in action shaping and touching each of the areas of your life. When you look at your life overall, there are only eight different areas: (1) Family & Friendships (2) Significant Other (if you have one or if you want one) (3) Spirituality (4) Goals (5) Health & Wellness (6) Work (7) Finances and (8) Enjoying life – “You” time. 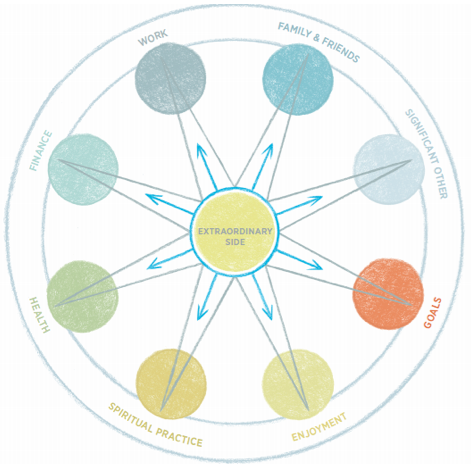 These eight areas encompass our entire life and anything and everything falls into one of these areas. Think about it, there is nothing in your life that falls outside any of these eight areas. That’s why I named it our Power Circle and if we can do the right things with each of these eight areas, we experience all the benefits that come from striking the perfect life balance. But, guess what. It gets even better than that. Because once you align your Power Circle, it sets you up to accomplish the things that are most important to you. This is another insight that has come out of my last year of research on successful people for my upcoming course. As many of you already know, the time has come. Next week, I am finally going to be ready to launch my course the 7 Secret Steps to Your “Something More”. I am so excited to be able to share the 7 specific steps that will allow you to accomplish those things that are important to you. Explaining how to maximize the momentum of your Power Circle is one of the essential 7 steps and an important part of the course because it accelerates your success. I hope you will join me in the course because I would love the opportunity to work with you directly. However, no matter what you decide, you absolutely want to maximize your Power Circle. So, today is the day to start taking the necessary steps to make that happen. 1. Chart Your Power Circle: Think through and list out what you want for each of the eight areas of your life : (1) Family & Friendships (2) Significant Other (if you have one or if you want one) (3) Spirituality (4) Goals (5) Health & Wellness (6) Work (7) Finances and (8) Enjoying life – “You” time. 2. Identify One Step: Determine one step for each of the areas you can take in the next 30 days. It doesn’t have to be a big step, but it’s important that you get things moving in the right direction in each of the areas of your Power Circle. Live Today Better than Yesterday.